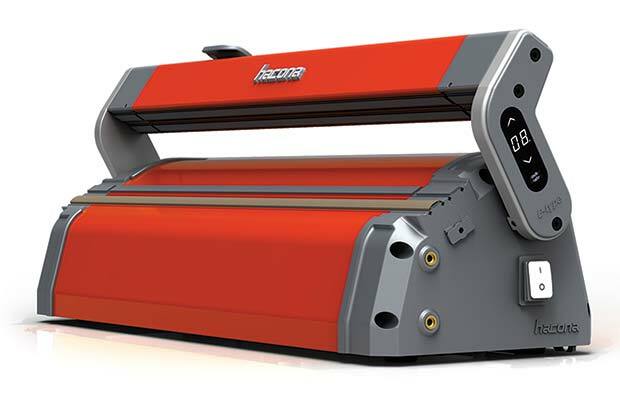 Digital technology increases impulse heat sealing productivity with the new E-Type from Hacona Following in the footsteps of the hugely successful S-Type, the new EType impulse heat sealer range features digital technology that increases productivity and seal quality. Sealing temperature and cycle time are now set and adjusted precisely on a digital display mounted unobtrusively on one arm of the sealing bar, giving more flexible control over seal quality and energy consumption. Adaptive Sealing Cycle Control (ASCC) automatically adjusts the sealing and cooling time to suit the working cycle speed so that the sealing wires do not overheat during extended, high-frequency use – a common cause of premature wire burn-out and maintenance downtime. The treadle-action pedal that mechanically lowers the sealing bar has been replaced on the E-Type with an electrical foot pedal connected to a motorised sealing bar. Now the operator can place the pedal exactly where it is most convenient and the head movement is faster and more consistent. An extra-wide 1320mm seal length model has been added to the range for larger applications and all five models ranging from 420mm to 1320mm can be supplied with an optional floor stand incorporating a film roll holder and a work table with height-adjustable bag support. The E-Type comes with an ingress protection rating of IP33 as standard. This means that the unit is protected against the insertion of any object larger than 2.5mm (the IP23 rating of the S-Type only protects against objects larger than 12mm) and from water sprayed at any angle less than sixty degrees from vertical. Optional IP44 rating further reduces these limits to 1mm and water spray from any direction. The standard finish for the E-Type is the classic Hacona orange powder coating, with an optional silver anodised finish for food processing use. Southgate will be supplying the EType through its established network of approved distributors throughout the UK and across Europe. Visit Southgate Packaging at Packaging Innovations on stand K48. With more than fifty years of packaging industry experience, exceptional service and a policy of global sourcing and innovative product development, Southgate Packaging ensure their customers stay at the forefront of the packaging product market via their sustainable supply chain.